It seems to be a time honoured tradition down at jolly old On-U Sound HQ to announce new albums, allocate them catalogue numbers, then to keep the devotees in suspense by waiting several years before delivering the goods. Such was the case with the Strange Parcels who first appeared in '91 with a trio of killer cuts on On-U's "Pay It All Back: Volume 3" (ON-U LP53) compilation (PIAB3) and the promise of an album to follow. The Strange Parcels and Fats Comet before them were reputedly conceived as a sort of "Temptations on acid" whereas I always thought of them more as the "'Diamonds on dope"! Originally the brainchild of mixologist Adrian Sherwood, bassist Doug Wimbish and one-time On-U main man David Harrow, the former Sugarhill Gang and ex-Tackhead supremos Skip McDonald and Keith LeBlanc were drafted in and the creation of studio mayhem and a string of headcrunching rhythms was soon underway. "Pay It All Back: Volume 3"
Kicking off PIAB3, "Disconnection" featured Mark Stewart on vocals, credited as "A. Salvador" (Angel Salvador). The MC introduction, an exhortation to burn down all the shelters of the corporate beast, was courtesy of Tokyo's Snakeman Show - Sherwood's productions for which were released on the now defunct Japanese Alfa label. The track also has a vocal sample from one W.S. Burroughs who inspired the PIAB series title. The Strange Parcels unguided attempt to pick up where Fats Comet left off is probably best epitomised by the the track that followed - "To Be Free". The exquisite voice of ex-Peech Boy, Bernard Fowler, leads an emancipation plea via a speed-fuelled doo-wop before the glorious late chorus from Akabu amidst the strangled interventions of the late Andy Fairley. The final PIAB3 offering, "Heart's Desire", was more typical of Dub Syndicate rather than the Strange Parcels and contained samples from Winston Scotland's "Buttercup" and Arnie Schwarzenegger's unmissable "Total Body Workout" album! Two years on and "Pay It All Back: Volume 4" (ON-U LP63) was released with a further five Strange Parcels offerings. "High Ideals And Crazy Dreams" [Rhythm 59] was the old Mark Stewart tune, but this time MC'd by the late Andy Fairley and delivered by Bernard Fowler in what can be described as a strangled soul croon with the sweet harmonies of Messrs. Wimbish and McDonald woven through the mix. This was a sound that was to become familiar over the next couple of years, mostly on the recordings which involved Skip - maybe a musical cure for the Tackhead hangover? As well as appearing on PIAB4 "More is Insane" was released later in the year as a 10" dubplate (ON-U DP23), with vocals from Bim Sherman, it turned out as a sufferer's ecology tune! The B-side of the dubplate featured a version of John Holt's "Man Next Door" [Rhythm 73] - a track which Sherwood had previously 13 years previously when he provided the mix for versions by the Slits. Also on PIAB4, Jesse Rae's "Victory Horns" was not only the strongest of the Strange Parcels tunes, but probably the best tune on the compilation and possibly would occupy a high position in an all-time On-U Sound top twenty - certainly it's a favourite of Adrian Sherwood. A superbly constructed song, the production lives up to the demand of the tune and the horns can only be described as immaculate. "A mix of hard hitting instrumentals and tasty vocal cuts courtesy of Skip McDonald, sword-wielding Scot - Jesse Rae and Yargo's Basil Clarke, "DISCONNECTION" was recorded, bastardised and packaged for maximum aural assault. The STRANGE PARCELS have arrived. Listen up." Though the album had a hand full of memorable tracks, for some it felt like the best material had already been delivered. The fact that the album turned out to be the last heard from the Strange Parcels also seemed to indicate that it's members had new plans. 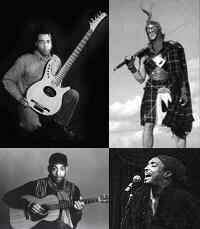 In particular the involvement of its core members in the Skip McDonald-fronted dub-blues project, Little Axe, which was just coming to realisation both as a recording and touring band. Like Fats Comet, the Strange Parcels didn't die, they mealy metamorphosed into new configurations for the purpose of moving on to even bigger and better things.